Young space entrepreneurs have been offered support for their ideas on using satellite data to improve life on Earth after taking part in a Dragons’ Den style event with leading industry experts. 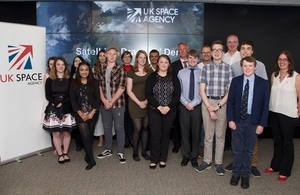 The 11 young people earned the opportunity to put their concepts to the panel at the Satellite Applications Catapult at the Harwell Campus, Didcot, after winning the UK Space Agency’s SatelLife Challenge. They were offered a mix of support including an offer to build a prototype of their product, thousands of pounds worth of space on Amazon Cloud Services, access to data, business development advice and a visit to a satellite factory. Sitting on the panel of judges was Stuart Martin, CEO of the Satellite Applications Catapult, Adina Gillespie, Head of Applications at Surrey Satellite Technology Ltd, Nick Appleyard, Head of Applications at the European Space Agency, Brendan Bouffler, Manager AWS Research Cloud Program, at Amazon Web Services, Kumar Pancholi, Business Development Manager at Sterling Geo and Karen Roche, Business Development Director of data company Kx. This competition has proved it doesn’t matter how old you are or what your background is. If you’ve got a great idea and you’re prepared to work hard you can make it in the space sector. Our space industry experts were blown away by the variety and high standard of the ideas and have offered some amazing opportunities to our winners. I’m excited to see where these ideas will go in the future. The overall winner of the competition was 13-year-old James Pearson, from Lincolnshire, who was inspired to look at what satellites could do for coastal change after seeing how flooding had affected some family friends. James had already been awarded £10,000 and met British ESA astronaut Tim Peake as part of his prize and was offered business development support from KX and Amazon Cloud Services, as well as support from ESA and the Satellite Applications Catapult. Chloe Hewitt, 19, from Solihull – Warehouse identification, using satellite data to accurately identify and map disused industrial buildings. Chloe was offered $5,000 worth of support from Amazon Cloud Services and support making contacts from the Satellite Applications Catapult. Isla Richards, 16, Buckinghamshire – Medical Satellite Programme, combining a GPS tracker and heart monitor to get help to people who are in the stage before a cardiac arrest. Isla was offered to have her idea turned into a prototype at the Satellite Applications Catapult. Elliot Vale, 22, and Tia Mountain, 20, from Worcestershire – GeoRescue, an app for people who live in or travel to high-risk natural disaster areas. They were offered business development support from ESA and the Satellite Applications Catapult to take their idea from concept to delivery. Lauren Paton, 15 and Ella Sheffield, 16, from Devon – Using satellites to monitor the movement around prisons to improve the UK prison system. They were given advice and connections with companies that could help. Jacob Lelliott, 15, and Paul Grimwade, 15, from Oxfordshire – SATUS, an app which pulls together information which is local to you on tourism, health services and the environment. They were offered business support and advice on how to market their idea. Jack Threlfall, 15, from Buckinghamshire – Mineral mining and identification, using imaging and other techniques from satellites to identify minerals and then explore the opportunity to mine them. He was offered a visit to Surrey Satellite Technology Ltd to see a satellite being built. Razzia Gafur, age 21, from Newcastle – Imaging in Space, using satellite data to support virtual reality activities. Razzia was offered business support. The SatelLife Challenge was a competition looking for inspirational ideas, from those aged 11 to 22, linking satellite and space data and its application to everyday life. The competition, intended to support the development of science, data handling and technological skills, was split into three age groups, offering prizes of £5,000 for the age categories with the overall winner receiving £10,000.